The DNR is responsible for administering more than twelve million acres of State-owned and State-managed mineral rights. DNR geologists increase their understanding of the estate’s mineral potential through graphical and statistical analysis of scientific data. Their mineral potential evaluations are based on new scientific data from geological and geochemical surveys that supplements information obtained from previous DNR projects and historical exploration records. 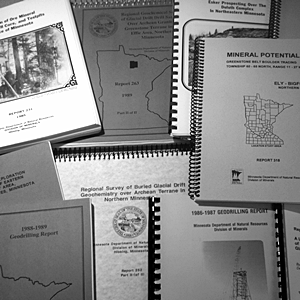 The DNR then applies this knowledge to issues that arise pertaining to the state’s mineral estate, such as mineral potential reviews for proposed land transactions. Data release public notifications - Why do this? The purpose is to make the new "raw analytical" minerals data for DNR mineral projects publicly available promptly, so that the DNR does not hold unpublished data while the project continues, often for a year or more, and the report is written. New government minerals data may provide clues to the location of valuable undiscovered mineral deposits. The objective of this public disclosure is to meet the intent of the legislature to disclose government data that is not protected by law. This provides transparency to the public and fairness to all mineral companies, who have equal access to the data. The Lands and Minerals Division will notify the public of new data releases through our GovDelivery email service. You can sign up below if interested in these notifications. The mineral potential project data release information is posted for at least 2 years on our Lands and Minerals News webpage. However after 2 years the data will continue to be available on the project webpages listed below. Shown below is a data table for published and open-file Mineral Potential Evaluation Section projects since 1976. Most of the projects have digital data to download found in the 'Link' heading farthest on the right. If a project has no digital data available there is an email link to contact us for more information. If you would like to search for projects spatially you can download the following GIS shapefile which includes an ArcGIS layer file and metadata. The shapefile attributes include a URL to hyperlink to project webpages to download data where available. Mineral Potential Evaluation Section project boundaries as of January 2017 (zip, 2.1 MB). You can also view the GIS data in the Drill Core Library & Mineral Exploration Collections Interactive Web Map. In the web map check on the layer titled 'DNR Mineral Potential Project Footprints'.